Kotobukiya has revealed their San Diego Comic-Con limited edition Deadpool “Chimichanga” ARTFX+ statue. 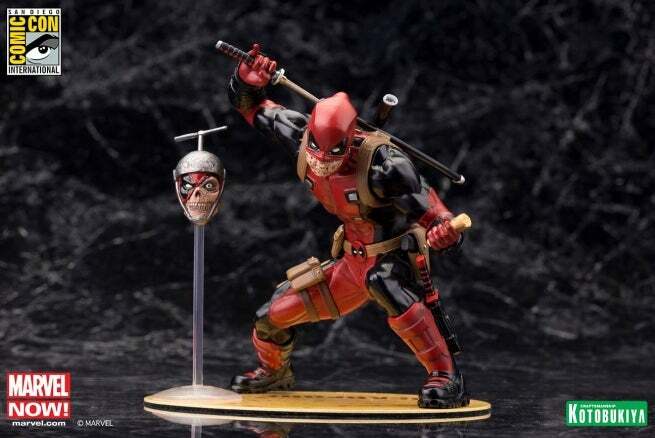 Wade Wilson is making his debut in the ARTFX+ series as he crouches in preparation for the attack, drawing one of his swords from the sheaths on his back. He’s wearing his classic red and black costume, complete with an abundance of straps, pouches, extra ammunition, spare weapons, pointy hood with his mask peeled back just enough to eat a chimichanga and display his scarred features. He also has his Deadpool logo belt buckle. In his low crouch the assassin leans forward with his other hand extended in front of him, and fans can choose between interchangeable left hands that hold either a chimichanga or Headpool. Sculpted by Junnosuke Abe, the same master craftsman behind the Marvel Now Avengers series, X-Force member Deadpool stands 6 inches tall (1/10th scale) in his deep crouch with perfect stability on his included magnetic display base. Pre-orders for non-attendees begin Friday, June 19 at 10 a.m. PST on kotous.com. The statue will be available in July 2015. Check out images in the gallery below.